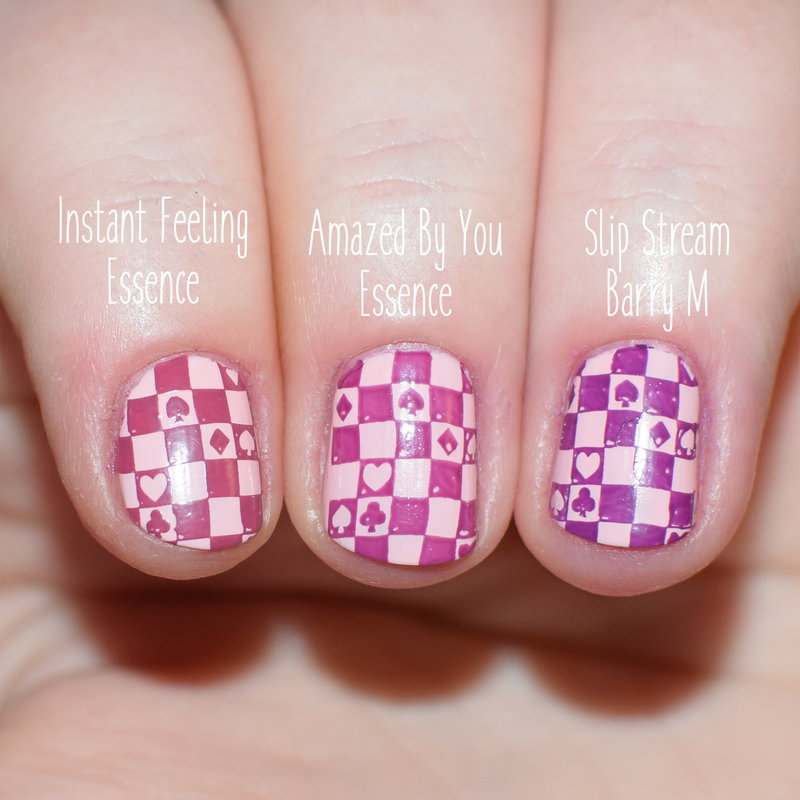 Essence vs Barry M // Which Brand Is Best For Stamping? 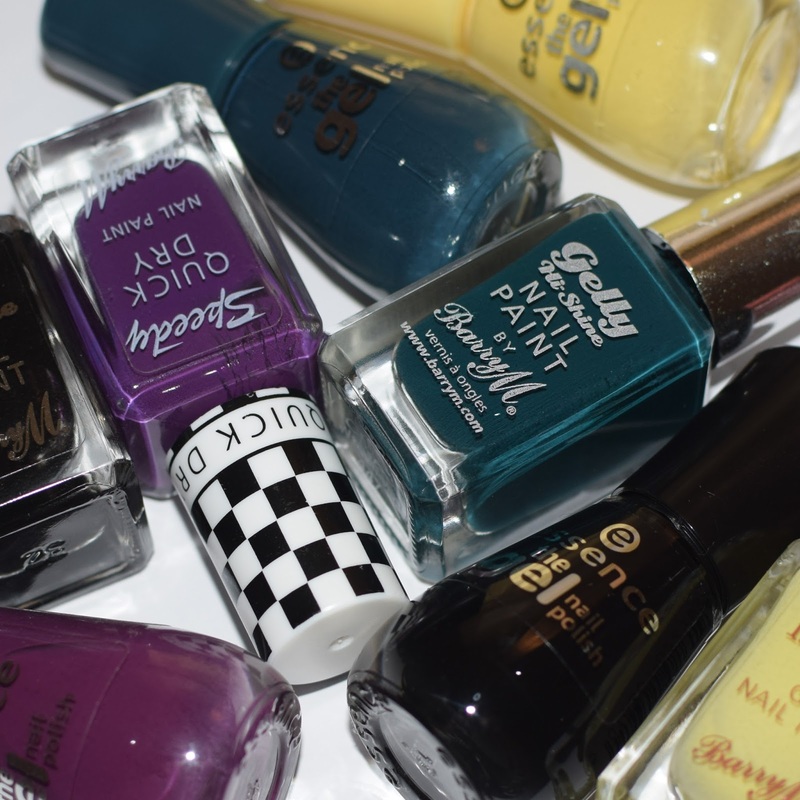 My top two favourite brands of nail polish are Barry M and Essence, and I use both brand's polishes a lot when I'm stamping nail art, but I always pick a polish to use based on the shade and not which is the better for stamping. So I decided to use similar shades of polishes by the two brands and compare how well they work as stamping polishes compared to each other. 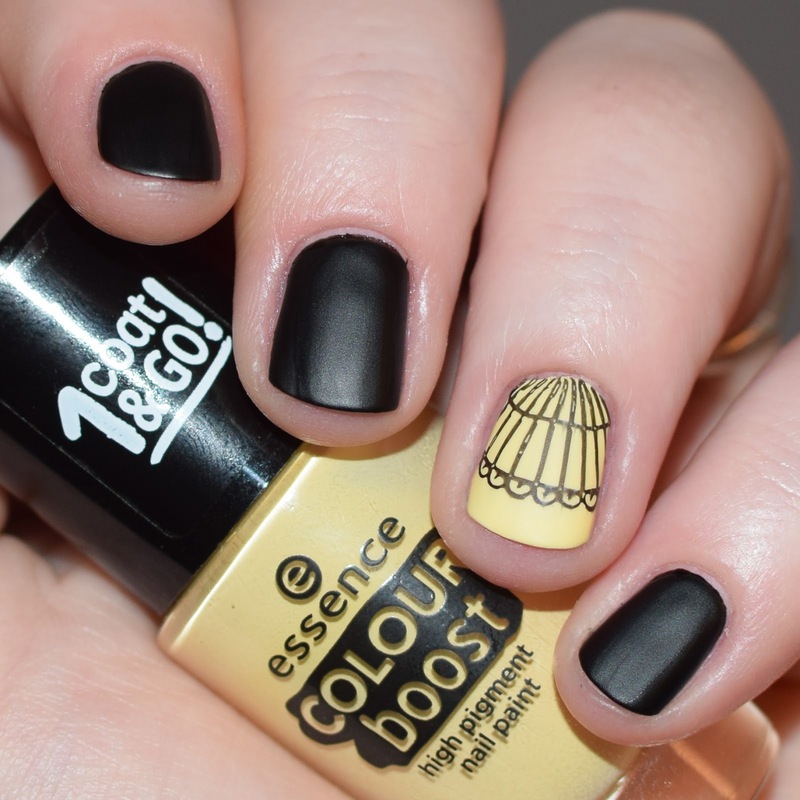 First is the classic stamping shade... black! I use black polishes for stamping probably 90% of the time, and although I usually prefer to use New Moon by Moyou London as my go-to black stamping polish, I have used Black Forest by Barry M a lot, as that is my go-to black base polish. I didn't own a black Essence polish until last week when I brought Black Is Back. And once I got it I decided to see how it compared to the Barry M black. Black Is Back by Essence is a clear winner for me out of these two black polishes. I was able to pick up the majority of the design, the Black Forest on struggled with the super thin lines like the top of doggie's heads. I also think that the Essence polish stamped slightly dark than the Barry M, although neither are as deep a black as Moyou's polishes (they are designed specifically for stamping though, and a lot more expensive). Out of these two Lagoona Beach definiately stamped more opaque than Watermelon, and they both had roughly the same amount of design pick-up. I actually prefer Watermelon out of these two. So for this one I decided to compare three polishes, the point in my testing was to compare The Gel line of polishes, because I already knew going into the comparison that if I used Essence's Colour Boost polishes they would always come out on top, the super pigmented formula makes them fantastic for stamping. 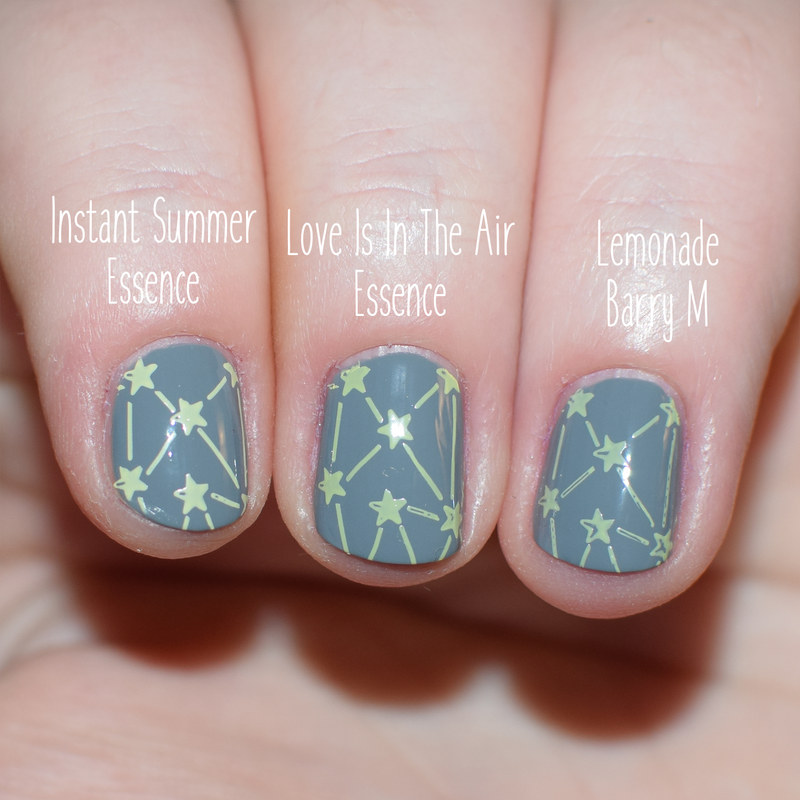 Anyway, Instant Feeling is clearly the winner but out of Amazed By You and Slip Stream (which are not the closest in shade, but the best I could do lol), I think that Slip Stream stamps more opaque, but I prefer the results of Amazed By You. I think that the Esscence one picked up and stamped the design better than the Barry M one, dispite it not being very opaque. Finally I tested three yellow shade. Like the last one, I stamped a nail using an Essence Colour Boost polish to see how much better it would be. Surprisingly the other Essence yellow, Love Is In The Air did almost as good a job. Both the Essence ones worked great, only a few gaps in the design and really pigmented (especially for being over a darker grey shade). I wasn't as impressed with Barry M's Lemonade, I knew it wouldn't be as pigmented, as it is quite a pale yellow and needs at least two thick coats to be opaque on my nails. It was also missing fair amounts of the design when I picked up the image. I was pleasantly surprised by how well the majority of these Essence and Barry M polishes worked for stamping. I feel like Essence was overall the winner for me. But for how cheap both of these brand's polishes are, and the fact that they are not formulated to be stamping polishes, they all worked great. I recently did a smudge comparison of Essence and Barry M's top coats over stamped nail art, you can read that here. 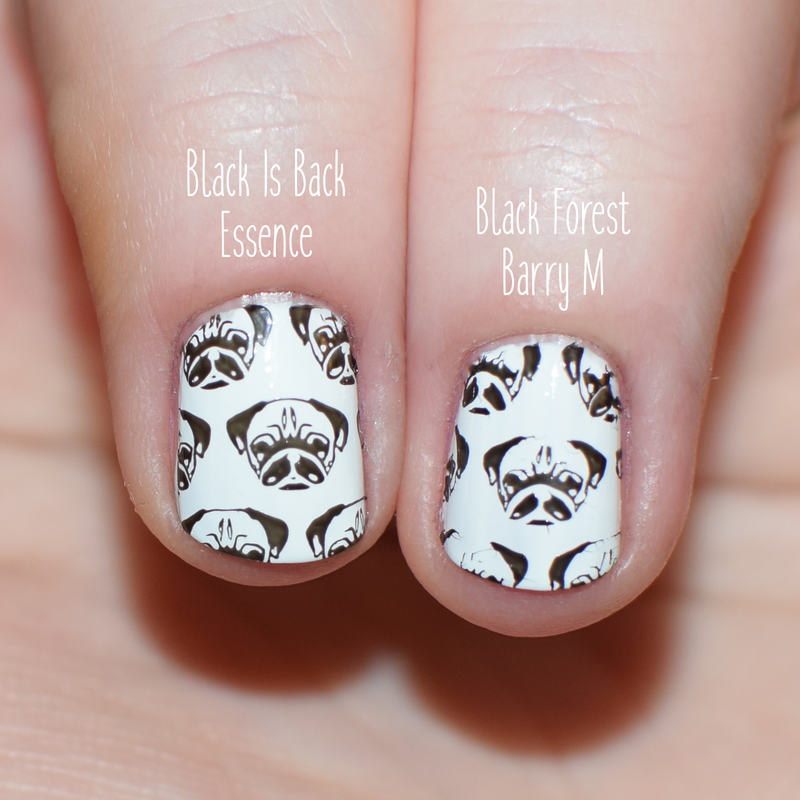 I haven't tried a white polish by Essence, but Cotton by Barry M is my go-to white for stamping. Have you tried an Essence white polish for stamping? Was it good? Let me know of twitter, @nimynails.